Let’s talk about the Zephyr. I mean first of all, the word is totally awesome. Zephyrrrrrrrrrrrr. Pronounced Zeffer, but spelled much more awesomely. And it makes you want to drag out the rrrrrrrr. And also, the ride is actually pretty fun. 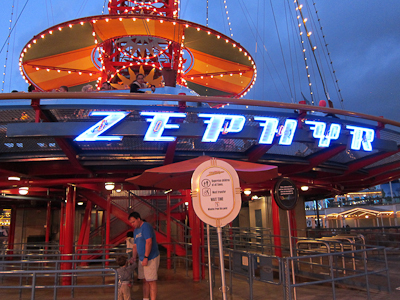 Zephyr is located in the Mouse-Next-Door (California Adventure) on Paradise Pier right by The Little Mermaid ride. It’s a spinner ride, in that you sit in a vehicle and spin around and around. Now I’ll admit, I didn’t go on this attraction for a long time. I was thinking, how many more spinner rides do we need? 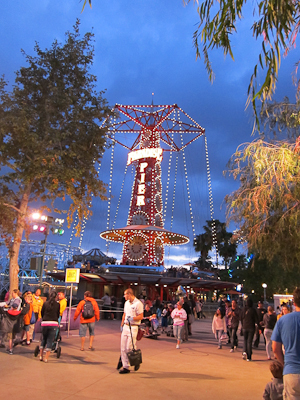 There’s Dumbo, Dumbo In Space (Astro Orbitor), and another one in A Bug’s Land I haven’t covered yet. But the Zephyr is different! Yes it is! Its cars are suspended by cables. This also makes it prone to being shut down due to high winds. Cause that could totally ruin your day. 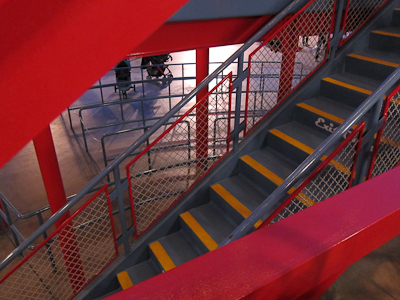 The Zephyr queue is all pipes and industrial. Like they put up the framework and then didn’t build anything else over it but then you realize it’s supposed to be all hip and industrial and then it’s cool again. 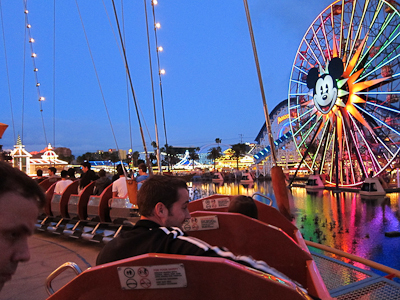 I know I posted this picture over in my Mickey’s Fun Wheel post, but if you look to the left of the Fun Wheel, you can see the zephyrs you’re sitting in. 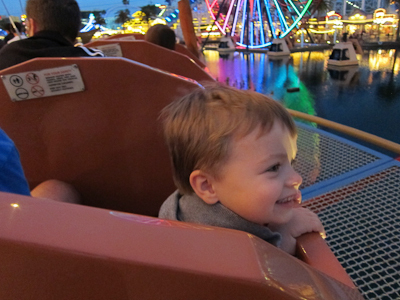 Theo totally loves this ride. And away you spin! You actually get some height, and unlike the stationary spinners, you get some swaying and natural movement as well. It’s like you’re in a giant vehicle suspended from cables spinning around at an amusement park or something! 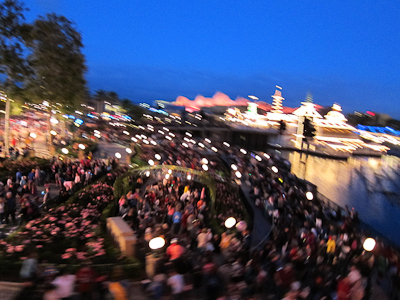 I also took this picture of the World of Color crowd while we were moving. To be honest, it kind of makes me a little loopy to look at it. But it’s a cool picture. You’re welcome. That last picture is TERRIFIC! It really give you the sensation of movement. Agreed though, it does give me a little vertigo looking at it for too long.